Little Auggie Pullman was born with a facial deformity which required 27 surgeries. There’s nothing more doctors can do for him, but he’ll never look normal. To shelter him from inevitable social ridicule, Auggie’s mother Isabel home schooled him through his elementary years. Auggie is a smart kid, particularly in science. But on the threshold of his middle school years, Isabel and her husband Nate hesitantly decide to enroll Auggie in a school – a prep school, mind you, but still a school. He’ll have contact with other students. The Pullmans are fearful, but Auggie cannot be hidden from society forever. This is the premise of Stephen Chbosky’s adaptation of R.J. Palacio’s best-selling novel “Wonder,” an uplifting treat for the whole family. 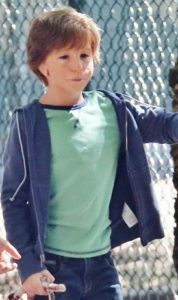 Jacob Tremblay (who gave one of the best performances of a child actor in motion picture history two years ago in “Room”) plays the intelligent but calculably shy Auggie, as a kid who simply wants (and needs) to fit in. At first all he receives are stares, but his classmates slowly begin to open up to him and accept him. But “Wonder” is not some sugarcoated after-school special. This is a wise and entertaining film, thanks to Steve Conrad’s adapted screenplay. Julia Roberts is Auggie’s overachieving mother, and Owen Wilson is excellent in an essentially non-comedic role as the father. But what sets “Wonder” apart from similar fare is the fully fleshed-out supporting characters. At first, Auggie acts as our narrator. But eventually that narration is passed off to Auggie’s sister Via (Izabela Vidovic), his friend Jack (Noah Jupe from “Suburbicon”), and even Via’s best friend Miranda (Danielle Rose Russell). This narrative sharing serves to provide us with the backgrounds we require to crystallize why the kids act the way they do. In other words, the proverbial “bad kid” isn’t bad merely because the story requires a bad kid (like the bad kid in “It“). Even though he’s a minor character, his family situation is exposed in one of the most poignant scenes, when he and his parents are called into the principal’s office. Likewise, we’re saddened at the outset when Miranda dumps Via as her best friend. But later during Miranda’s narration portion, we understand. And Via herself isn’t merely the token older sister. We spend almost as much time with Via’s story as we do that of Auggie. We follow Via’s participation in the school play, and her relationship with her former best friend Miranda. Via has always been supportive of Auggie, and overly understanding of the outsized role her mother must play in Auggie’s life. That’s to be expected. But Chbosky’s and Conrad’s screenplay allows us to examine Via’s life enough that we understand her understated feelings of resentment toward Auggie. It’s a very special role, and Vidovic handles it deftly. 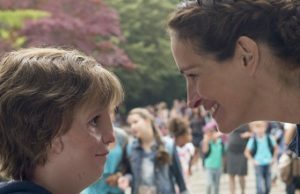 While adults aren’t completely absent from the screenplay (a la Charlie Brown), “Wonder” is truly a story about kids, told from their perspective. And the assemblage of young actors is the best since Andy Muschietti’s “It,” although these kids made more of an impression on me – likely because they deal with the real world, as opposed to an allegorical scary clown. The acting is top-notch, including an almost unrecognizable Mandy Patinkin as the principal. The screenplay is clever and well-structured. And I hate to use the term “feel-good,” but what else can I say? “Wonder” is the feel-good movie of the year. It’s 2017’s “Mr. Holland’s Opus.” It likely doesn’t break enough new ground to warrant Oscar consideration, but it deserves to bring in good box office. I really enjoyed this one.